Concordia plays the magical English music of the golden age and a wide range of renaissance and baroque repertoire from Italy, Spain, Germany and France. Concordia often works with guest artists on other instruments and, above all, the human voice, regular collaborators including countertenors Robin Blaze and James Bowman, tenor James Gilchrist, baritone Peter Harvey and soprano Rachel Elliott. Perhaps because of the breadth and appeal of its stimulating programming, which also includes new commissions, contemporary dance and poetry, Concordia is now one of the most active British chamber groups, appearing at the Wigmore Hall, festivals throughout the country and major venues across Europe. The regular members of Concordia are Mark Levy, Joanna Levine, Emilia Benjamin, Reiko Ichise, Alison McGillivray and Markus Tapio viols, Elizabeth Kenny lute and Gary Cooper organ & harpsichord. Mark Levy founded Concordia in 1992 to explore music involving viols of all shapes and sizes. 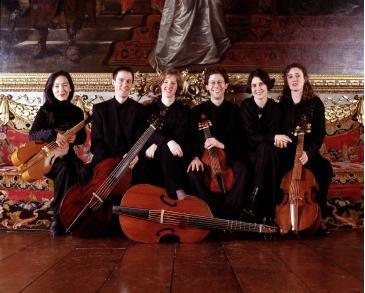 The ensemble has gone on to appear regularly at the major British music festivals and throughout Europe, as well as as at the Wigmore Hall, the Purcell Room and the Queen Elizabeth Hall, where they played in the first Royal Festival Hall Early Music Festival. Acclaimed in the British and European press for its concerts, radio and CD recordings, Concordia has gained a special reputation for its imaginatively themed programmes, often exploring links with the other arts. Concordia’s innovative programming has led to performances combining music with newly-commissioned dance, poetry and drama: most recently a set of monologues for Elizabeth I premiered by the well-known actress Penelope Keith at the Covent Garden Festival and touring the UK this summer including the Lichfield, Brighton and King’s Lynn Festivals. Other collaborations have included work with Will Kemp of the Adventures in Motion Pictures dance company and the poet Glyn Maxwell, while several recent concert appearances, radio broadcasts and recordings have been linked to major exhibitions at the Royal Academy of Arts and the National Gallery. Recent appearances have included a return visit to the Bruges Festival and several concerts in France including the Festivals of Maguelone and Haut-Jura, as well as numerous concerts for the BBC, German and Belgian Radio. Concordia’s CD releases of music by Orlando Gibbons have been showered with awards including a Diapason d’Or, Choc de Musique and 10 de Répertoire in France, an award from Fonoforum in Germany, an Outstanding rating from BBC Music Magazine and an Editor’s Choice in Gramophone. The next release, of music by the brilliant maverick English composer William Lawes, whose 400th anniversary fell in 2002, complemented two critically acclaimed recitals in the Wigmore Hall’s Lawes anniversary series and a programme for BBC4TV’s series on Lawes as well as a tour on the Dutch Early Music Network. Other ongoing projects include a set of new commissions for viols, including pieces by John Tavener and Gavin Bryars. Music from their most recent recording for Metronome, Titian: Venice and the Music of Love, was featured on the cover CD of BBC Music Magazine; it formed the basis of a concert at the National Gallery to complement the Titian exhibition there and is being toured with the help of the Arts Council’s fifth major award to the ensemble on the National Touring Programme in the autumn.